We have been family owned and operated since the early 1970's. Working on cars is not just our business its our passion. We have been at the same location for over 30 years, a Willow Glen tradition in San Jose. We are located on Almaden Road between Willow Glen Way and Malone. We live in and love the community we are a part of. There is no better way to understand your clients than to live in and around them. We care for your car as if you are family. When you bring your car to B & C Auto for any auto repair needs you can be sure that we will be honest, upfront and courteous. We take pride in offering you the kind of service that you deserve. Over the years, we have grown and developed into a full staff of highly trained and experienced technicians and service advisors. We take great pride in providing a quality of auto repair in Willow Glen San Jose that is second to none, combined with customer service that treats our clients more like friends than just customers. 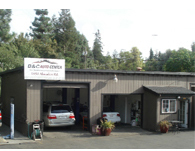 Our auto repair shop in San Jose is a trustworthy partner for all kinds of automotive maintenance and repairs. Your personal auto safety is assured when your car is on the road running smoothly. That's why we don't merely provide comprehensive consultation, but we also perform important safety checks for you. Our technicians go through intense professional training to be ASE certified technicians. This way you are assured quality service.